Light delicate pasta encases a delicious filling of rosemary seasoned ground lamb and goat cheese. 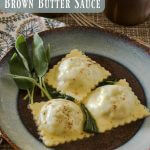 The sauce is a light combination of brown nutty flavored butter, lemon, and fresh sage leave. An ideal dish for a special meal or occasion. 10 oz frozen spinach thawed chopped and moisture removed with paper towels. In a large sauce pan sauté the garlic and rosemary until they seasoning releases aroma and flavor. Add the ground lamb to the pan. Salt and pepper the meat. Brown the meat breaking up the chunks with a wooden spoon. Once the meat is browned, remove it from the pan discarding any of the juice in the pan. Let the meat cool slightly and put it in the bowl of the food processor. Add the spinach and pulse several times to make sure all the ingredients are mixed. Scrape the meat filling into a bowl and mix in the goat cheese. A warm filling makes the cheese easier to mix with the filling. If not using right away, refrigerate. When you're ready to use the meat-cheese filling, make sure to warm it up. In the bowl of a food processor mix the flour and salt. Add the eggs one at a time along with the olive oil. This goes quickly and if the dough is dry, you may need 1 Tablespoon of water. Let the dough rest for 30 minutes. You'll cut the dough in fourths. Follow the step by step directions as in the Beef Cheese Ravioli recipe. While the ravioli cook, melt butter in a large saute pan or heavy skillet and continue cooking until golden brown color (noisette) appears in the thinest liquid of the butter. Continue to stir and once you reach the golden brown color remove the skillet from heat and add the sage leaves. Add lemon juice and set aside. Gently pour the drained ravioli into the sauce pan and return to heat. Add the cheese and a little of the reserved boiling water and toss to coat. Serve Immediately. This recipe makes 60 ravioli. We figured 4 ravioli as a main dish serving. We had to quadruple the sauce recipe so there would be enough sauce. The original sauce for 4 servings - you can adjust the sauce. **TIP: Don't have time to make pasta from scratch? You can find fresh pasta sheets in stores or even use Won Ton wrappers.